Tonight I stumbled upon an absolutely essential interview on xconomy.com with Carl Dietrich, Terrafugia’s CEO and co-founder. 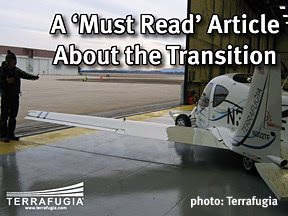 I say "essential" if you are a fan of the Transition roadable airplane project, because it is the first time I have found clear, detailed answers to many of the questions that people ask about the Transition. "We were a bit surprised by the comments that readers left here and at Slashdot—the majority of which were critical, even dismissive, of Terrafugia’s concept as a viable business proposition. Given that “flying cars” have been fodder for sci-fi movies, cartoons, and Popular Mechanics covers since the 1930s, it’s understandable that some people feel jaded about the latest promises for airplane-automobile hybrids. 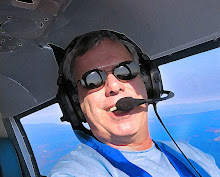 But whether or not you’re personally interested in traveling in an airplane with folding wings that doubles as a road-worthy automobile, quite a few private pilots are—as the three-year waiting list for a Transition demonstrates." "X: The Transition will be so light and will have such a large side-facing surface area that crosswinds will blow it off the road. If you take it across the Mackinac Bridge, [are] you’re going to end up in Lake Michigan." "X: Anything that has to pass highway safety tests will be way too heavy to fly, and anything that is light enough to fly will be incapable of surviving a roadway crash." "X: Others have tried to build flying cars or roadable aircraft, and they have always failed. What makes this attempt any different?" You can see that this interviewer pulled no punches. And I did not even show you the real zinger questions. What is amazing is that each time, Dietrich handled the questions with what sounds like 'Barack Obama' cool, layering his answers using skills that surely have been honed in the debate halls of one of this country's finest universities. So if you care even a tiny bit about Terrafugia's Transition, go here and read the full interview.